Double-pole switches use two separate sets of contacts to control electrical power. There are also two-sets of screw terminals on the side of the switch for the connection of the wires. Power is fed to the switch from the main electrical panel through a 220-volt double-pole circuit breaker. This electrical power supply is called the line feed. The wires going to the device that the switch controls are the load wires. 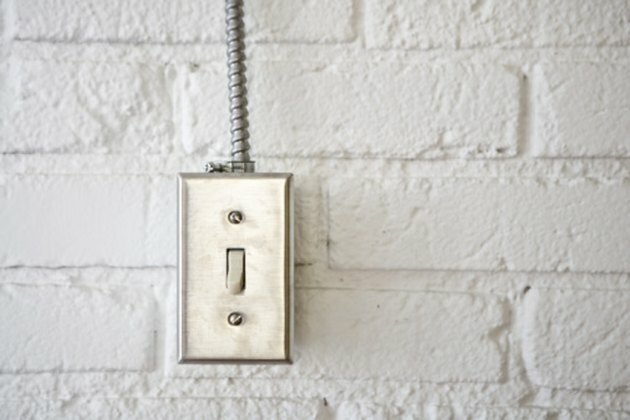 Shut off the electrical supply by switching off the double-pole circuit breaker. Strip off a 1/2 inch of the wire insulation with the wire strippers, revealing the bare copper underneath. Bend a small hook in the bare copper ends of the wires with the wire pliers. Loosen the terminal screws on the switch by turning them in a counterclockwise direction. Fit the bare copper ends of the wires coming from the main electrical supply panel under the screws identified as "line." Place one wire under each screw. Tighten the wires with the screwdriver in a clockwise direction. Connect the two load wires going to the device under the screw terminals marked as "load." Attach one wire to one each of the terminal screws and tighten.